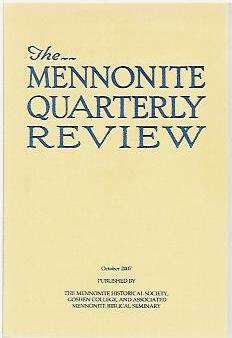 The Mennonite Quarterly Review publishes articles on the Radical Reformation, Amish, Mennonites and Hutterites refereed by leading scholars in the field. Published continuously since 1927, the MQR is a collaboration between the Mennonite Historical Society, Goshen College, and Anabaptist Mennonite Biblical Seminary. The Mennonite Historical Society (MHS) at Goshen College, founded in 1921, was reorganized by the late Harold S. Bender in 1924 and has continued its work to the present. The Society usually hosts two programs each year, in the fall and spring. The mission of the Mennonite Historical Society is to promote public understanding of and interest in Anabaptist/Mennonite history and contemporary Mennonite life and thought in order to serve the broader goal of promoting commitment to the Christian faith. The mission is pursued by encouraging and supporting scholarly research, by publishing the results of such research, and by promoting the collection and use of source materials. The fruits of these efforts are extended through such activities as teaching, public programs, and exhibits.